I am a thinker, a planner, and a packer. Lately I have been pondering the best elimination communication supplies. I started by contemplating the best cloth diapers to use as backup for EC. Now I am researching the best diaper bag for families practicing elimination communication. If you are new here, elimination communication is a gentle method of allowing babies to use the potty or toilet, instead of relying completely on diapers. It's hard to find advice regarding diaper bags for elimination communication. There are recommendations for cloth diapering, but not much for those of us who both cloth diaper and practice elimination communication. I hope to fill in the gaps with pointers specific to EC'ing families. 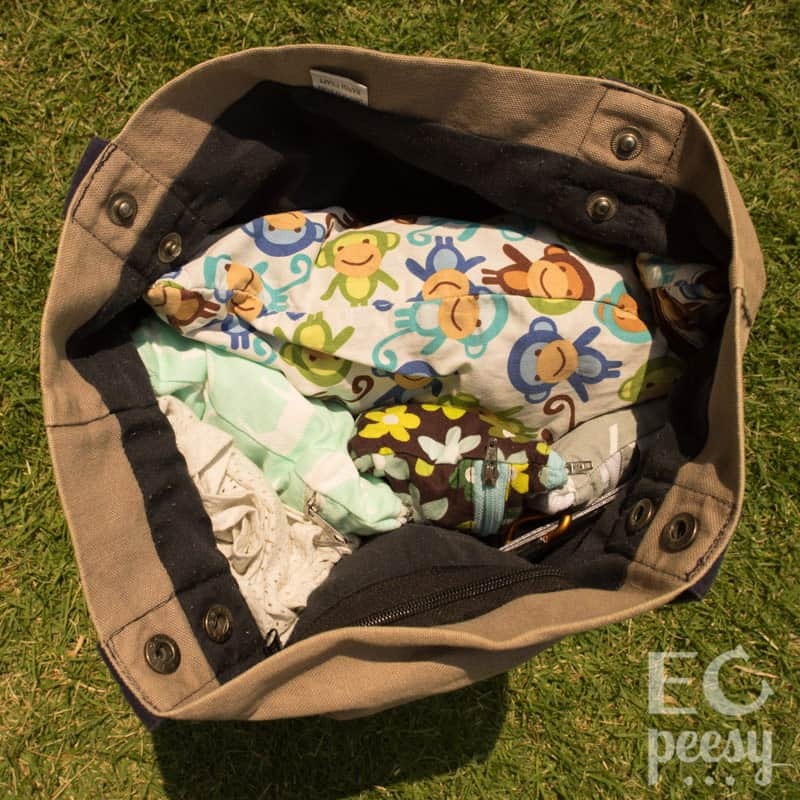 This post will cover selecting a diaper bag for elimination communication; using wet/dry bags to pack cloth diapers or a travel potty; and checklists for packing a bag for each phase of EC: newborn, mobile baby, and toddler. If you would like to share what works well for you, please leave a comment! I have been through the elimination communication journey with my son, who is now three-years-old. Lately, I've been thinking about what I would do differently next time around. I am definitely armed with more information and a better understanding of EC. With my son, I thought I would just give EC a try to see if it was possible. Now that I know elimination communication works, I'm thinking about which tools would be the most practical and helpful. Even if you will be practicing elimination communication full time with your baby, chances are that you will be using some sort of backup (cloth diapers, training pants, etc). If you choose to let your baby go completely diaper-free without any backup, then you will probably want to bring some changes of clothes along for your baby. 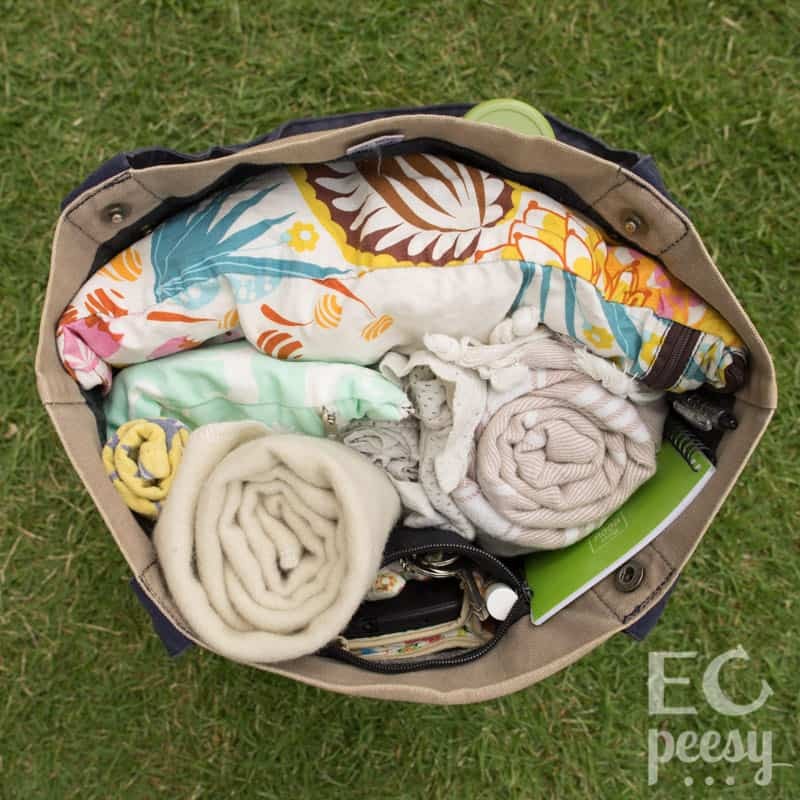 Some of you may be planning on EC'ing with the hopes of not needing to carry a diaper bag. 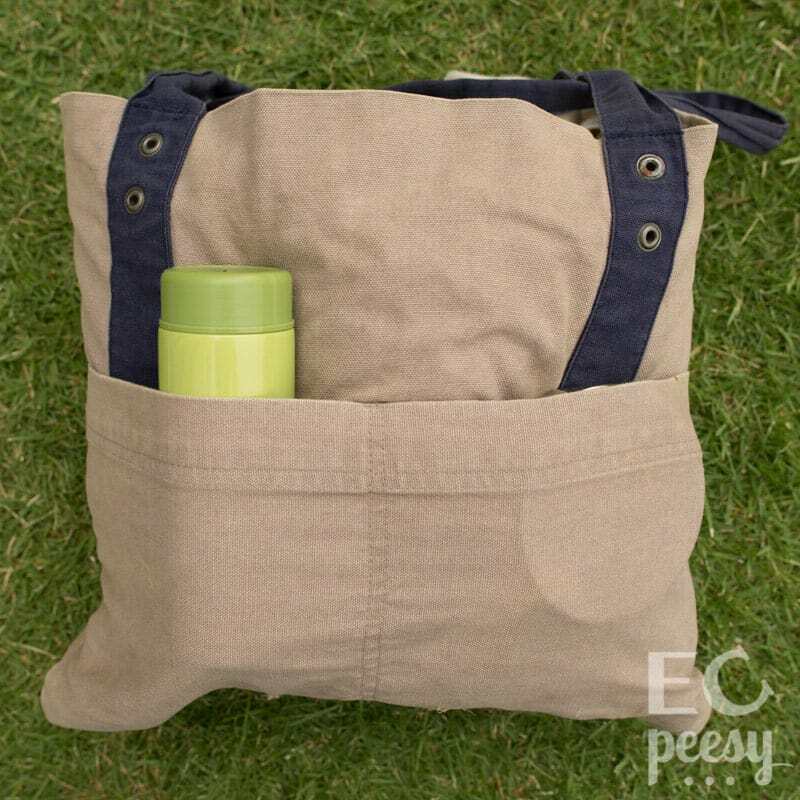 If you can manage to carry minimal items, more power to you! Even though I am a strong proponent of elimination communication, I love cloth diapers and diaper bags! When I pack a diaper bag for elimination communication, I personally need to bring along everything I will need for myself and my baby for a half day out (we usually get home by nap time). If you typically drive a car to your destination, you could leave a small potty in your car, along with an extra bag of diapers. Since we don't currently own a car, I roll wearing my baby on the front in a soft structured carrier while carrying our essentials in a diaper bag. A typical day during my son's first year would involve me walking about two miles round trip while babywearing. We would walk to the park for a baby group meeting, go to the beach to meet with friends, or walk or take the bus to hula class. Last time around, I didn't make the best choice when selecting a diaper bag for EC. I had fallen in love with Petunia Pickle Bottom diaper bags and selected the Touring Tote, for its compact size. The Touring Tote can be worn with a cross-body strap, as a messenger style bag. It also comes with stroller clips which are super convenient for hanging the bag on a stroller. (I know this from borrowing my sister-in-law's Touring Tote while babysitting my niece). Since I planned to wear my baby and not use a stroller, the cross-body strap and stroller clips were not the best choice. I should have chosen a backpack style diaper bag! It was possible to wear the cross-body strap between me and my baby while wearing my baby in an ErgoBaby carrier, but it wasn't comfortable having all of the weight distributed on one shoulder. I also wish I had chosen a larger bag. While pregnant I carried a tiny purse and thought I could get away with a small diaper bag. But having a few extra inches that you can either leave empty or pack for particular occasions is so worth it! If you will be babywearing often (which is super helpful for EC), a backpack style diaper bag is more comfortable to wear. If you will mostly use a stroller, choose a diaper bag with stroller clips. 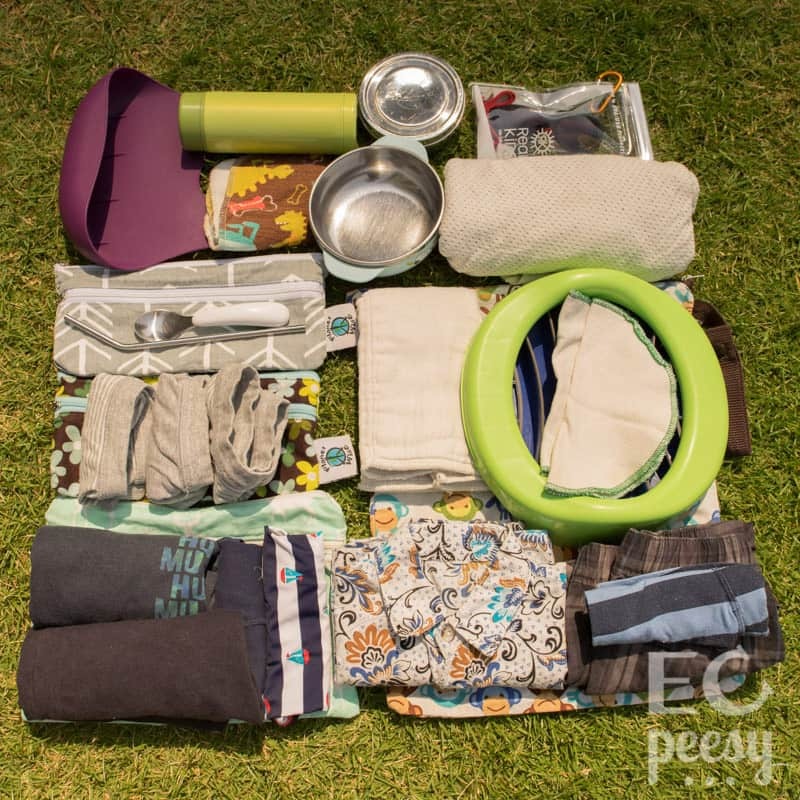 If you plan to carry a small potty or foldable travel potty, choose a bag that will accommodate the potty. Find a balance between a bag that is large enough but not too heavy. The bag should have a convenient loop or handle on the top for hanging it on the door in public restroom stalls. Items that you will need to grab quickly should be easy to access. It's nice to have 2 outside water bottle pockets. This allows you to reach your water bottle while wearing the diaper backpack on your back and your baby on your front in a carrier. Think of the diaper bag as an investment for your baby's first year or two. I don't foresee your little one being in diapers for three years if you do elimination communication. Choose a diaper bag that is not only functional but also sparks joy! Here are some suggested elimination communication diaper bags that can accommodate cloth diapers or a travel potty. I believe that you can fit either the Potette Plus or the OXO 2-in-1 Go Potty into each of these bags, but I have not personally tried each bag, so no guarantees. You may also be able to find a daypack or a regular backpack that suits your needs. Disclosure: This post contains affiliate links. If you click on an affiliate link and make a purchase, I will earn a small commission, at no extra cost to you. Thanks for your support! With my second baby I started out with the Lily Jade Lorie lifestyle bag. It didn't meet all of my criteria, but I liked the sleek tote design. In March 2019 Lily Jade released the new Anna backpacks. The Anna lifestyle backpack comes in either large or medium size. 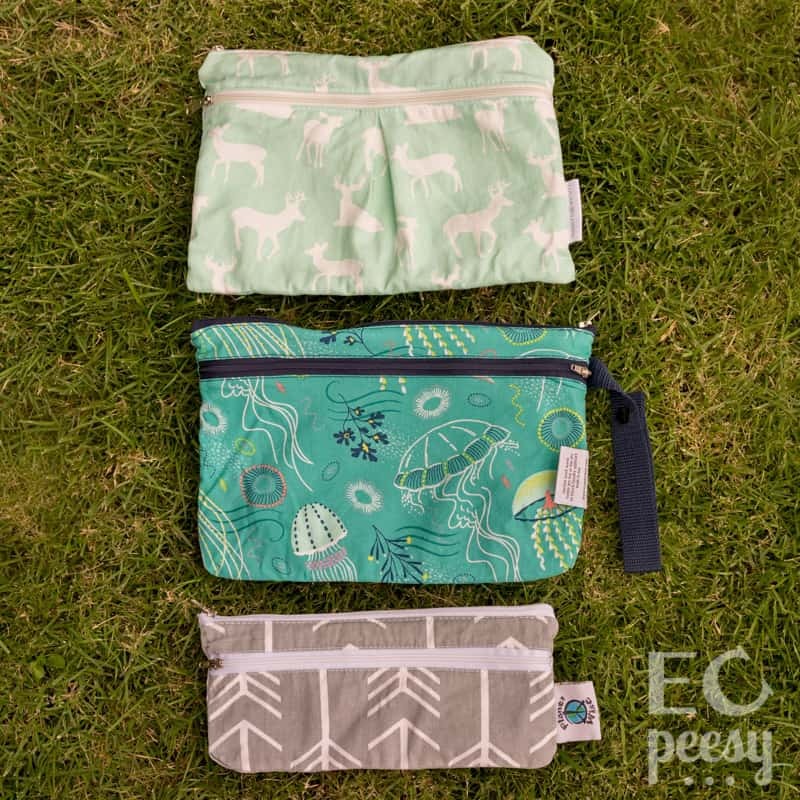 Both of these bags are in the lifestyle collections, so they don't come with the organizer or change pad that Lily Jade diaper bags come with. That's okay, since I prefer to pouch pack with wet/dry bags. Keep on reading down to the section about packing for a toddler to see a video showing how well the medium Anna backpack works for packing a travel potty and training pants. The Lily Jade Anna is so adorable, it definitely sparks joy! This backpack is divided into two sections, so I can pack my baby's items in the back compartment and my items in the front compartment, or vice versa. The back section has a sleeve for a tablet and opens all the way down to the bottom of the bag. I like that even though it is a backpack it can also be worn as a crossbody bag. This is a feature I will probably use while traveling. Lily Jade finally made a bag with large exterior water bottle pockets! Yay! Perfect for our Hyrdo Flask water bottles. I think this just might be my unicorn diaper bag! The medium Anna is heavier than I would like, at 2.6-3 lbs. It is comfortable to wear if I don't pack it too heavy. The medium Anna might not be big enough to pack a bunch of cloth diapers and a travel potty, in which case you could get the large Anna which is 13.25" W x 15" H x 7.5" D.
Lily Jade bags are luxury diaper bags, so they come with a high price tag. I sold my previous diaper bag and any other baby items we no longer needed in order to get the Anna. Great print for Disney fans! I wish Petunia Pickle Bottom would bring back their organic cotton bags! I love the convenient pockets on the Ju-Ju-Be Be Right Back Backpack, especially the extra little pocket for wipes at the top back of the bag. I would probably be able to unzip the side changing pad pocket and remove the changing pad without taking the bag off of my back, which would be convenient. The mesh back and padded straps look comfortable. It has two outside insulated water bottle pockets. There is a lot to love about the functional design of the Be Right Back Backpack, but I just can't look past the synthetic materials with which it is made: Polyester, Teflon, memory foam, and Agion anitmicrobial lining. When I contacted Ju-Ju-Be customer service, they explained that the Capstone Teflon used to treat their bags is different from the Teflon used on frying pans and does not emit PFOA's. 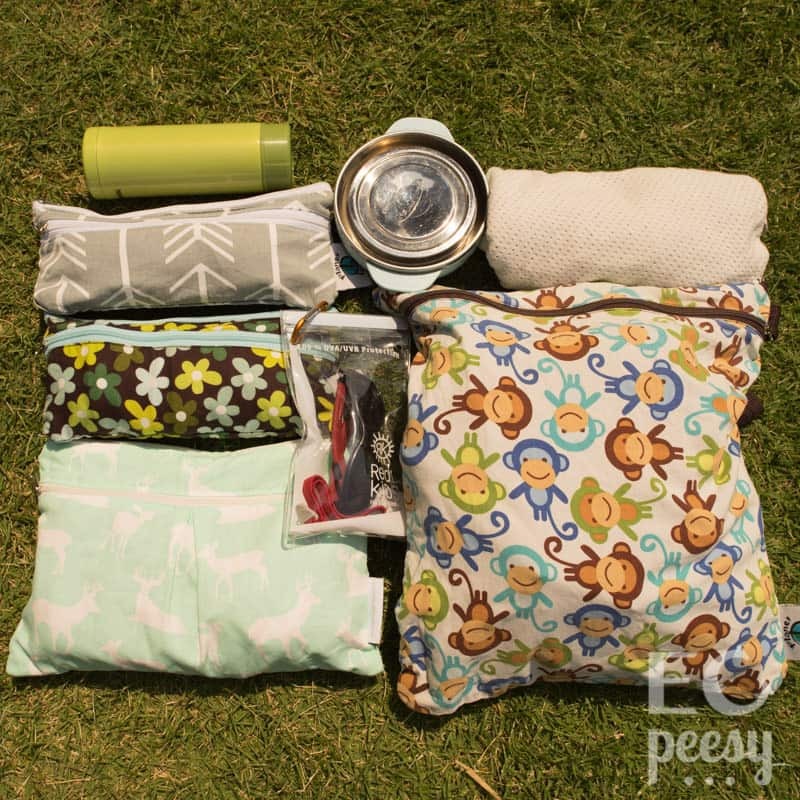 Their bags are also free of BPA and phthalates. However, they did admit that the memory foam changing pad can off-gas VOC's, and suggested washing the changing pad before use. Two outside water bottle pockets. The top carry handles would work well for hanging the bag on a hook. 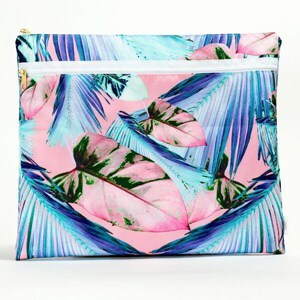 LeSportsac bags sometimes come in gorgeous prints, especially in their Hawaii stores. The Baby Utility Backpack is unstructured, so it may not stand up on its own. The internal organizational pockets do not look very nice. 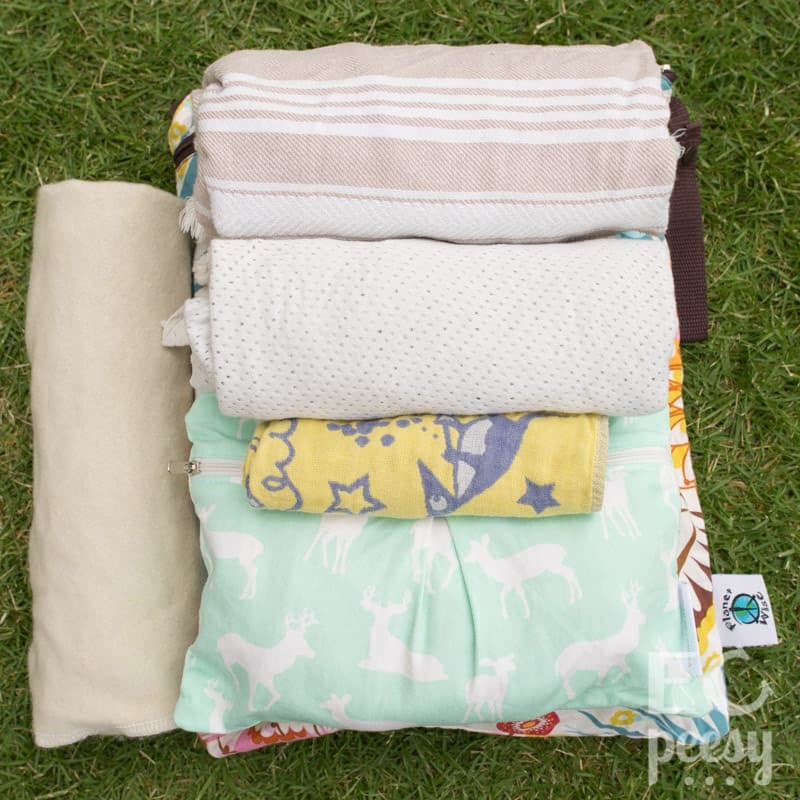 The key to successfully packing a diaper bag with a travel potty or cloth diapers is using wet/dry bags. I just love them! With my son, I used a set of Planet Wise wet bags . I had a small wet bag which fit about two cloth prefolds; a wet/dry bag which is about the same size as their medium wet bag; and a large wet bag which I kept at home for holding dirty cloth wipes. The wet/dry bag was my favorite. We were still using it three years later, to carry the Potette Plus in the waterproof pocket. There are so many brands of wet bags to choose from these days! I will share my two favorites with you. I recommend getting wet/dry bags, which have one compartment for holding dry items, and one waterproof compartment for wet items. They are more versatile than simple wet bags, which only consist of one waterproof compartment. The great thing about wet/dry bags is that you can pack the clean items in the dry pocket, and as they get dirty, you can move them to the wet pocket. This helps me organize everything by category in my diaper bag. Bathroom items together, meal time items together, extra clothes together, etc. Note: Wet/dry bag measurements mentioned below are given as the measurements before washing. The bags will normally shrink a little when washed. The Planet Wise Wet/Dry Bag is perfect for elimination communication! It can serve different purposes during the various phases of your EC journey. During the newborn phase, you can use it to carry cloth diapers. As your baby gets older and there are more catches in the toilet and fewer misses, you can pack a travel potty in the wet compartment. Either the OXO Tot 2-in-1 Go Potty or the Potette Plus will fit in the Planet Wise Wet/Dry Bag. Another option is the Logan and Lenora Portfolio. It has a large waterproof pocket and an outer non-waterproof pocket. Either the folded OXO Tot Go Potty for Travel or the Potette Plus can fit in the waterproof pocket. Meal time supplies (bib, placemat, spoon, etc). I use a Planet Wise Wet/Dry Clutch for carrying spare outfits for my son and baby in my diaper bag. The Planet Wise Travel Wet/Dry Bag is perfect for organizing smaller items in your diaper bag. It works great for carrying a bib, spoon, straw, and washcloth. 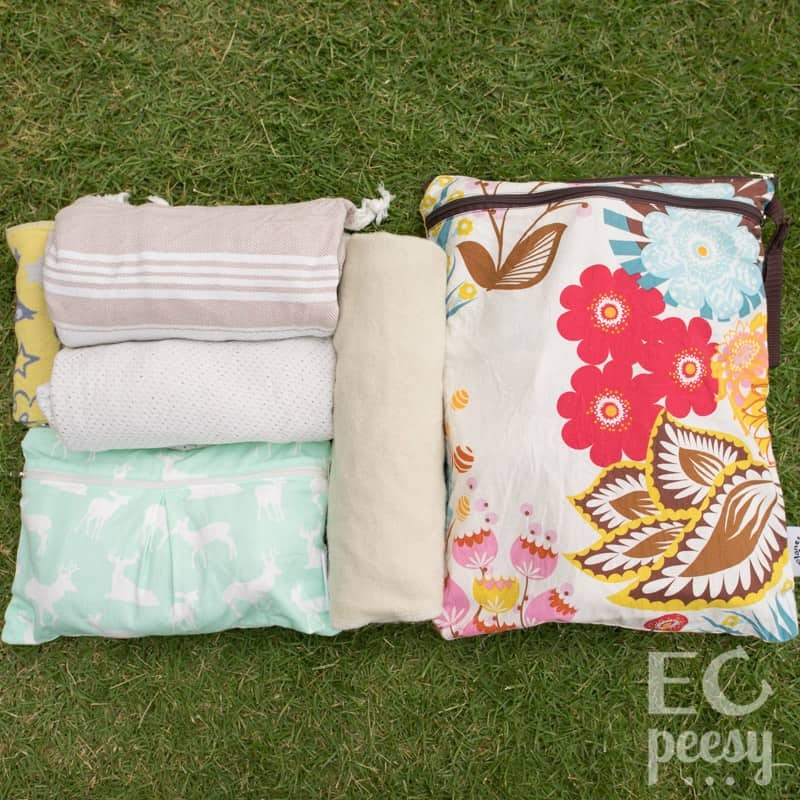 Keep clean items in the dry pocket, and after meal time move them to the waterproof pocket. Here are checklists for packing an elimination communication diaper bag for each stage: newborn, crawling baby, and toddler. I used a tote bag for this demonstration since I was still shopping for a backpack diaper bag when I wrote this post. The tote bag shown in these photos is 16" W x 14" H.
I would bring along sun hats for myself and my baby, but we usually wore those as we left the house. I also wore my baby in a soft structured carrier. 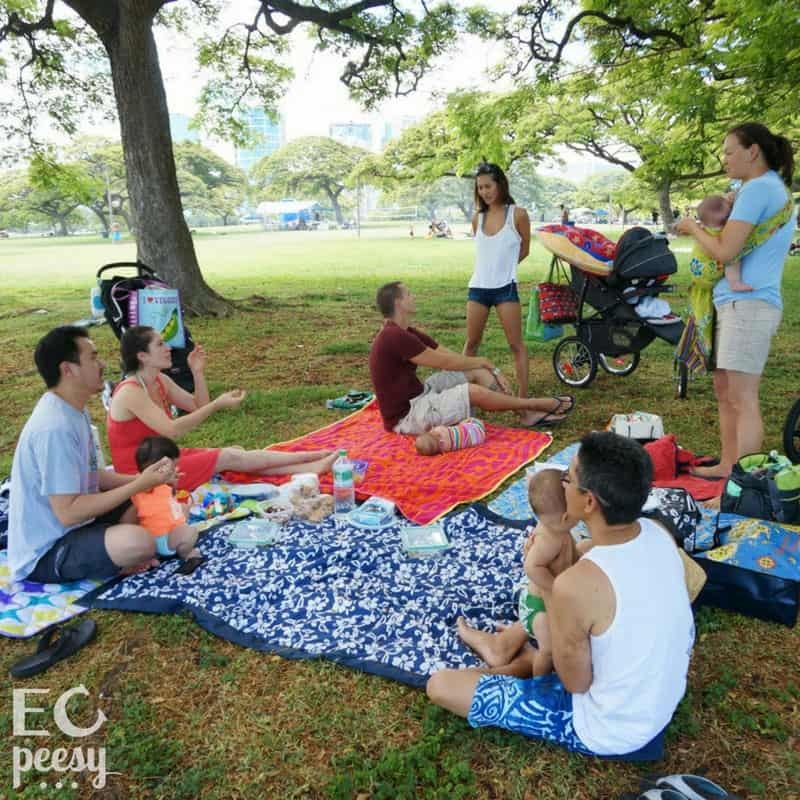 Babywearing is so helpful for EC! Whenever my son needed to pee, he squirmed to get out of the carrier. 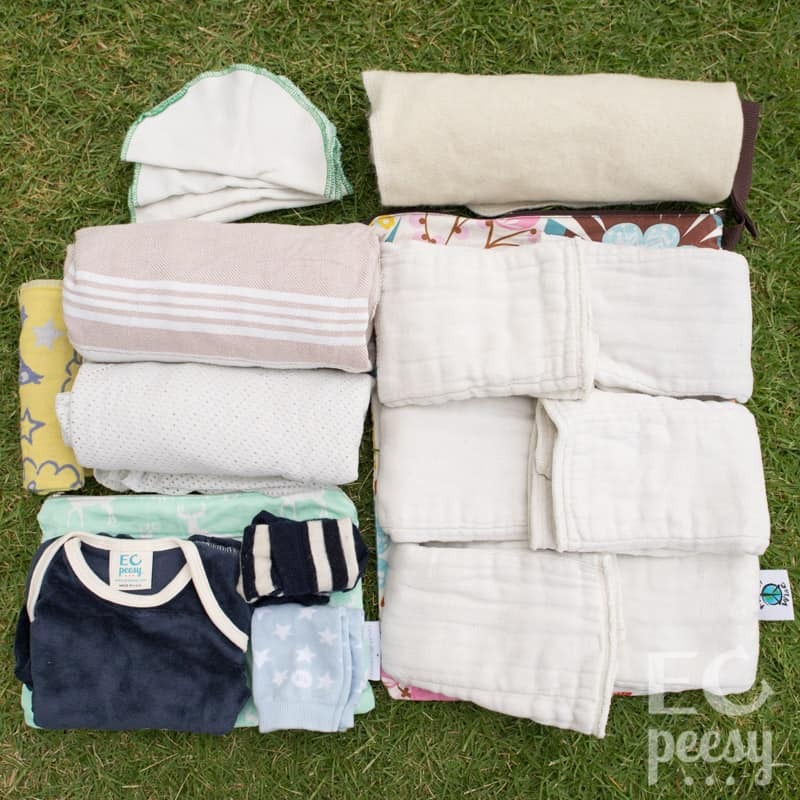 It can take a while to figure out how many cloth diapers and covers to pack during the newborn stage. It depends how frequently your baby eliminates, your catch rate, and how long you will be out. I remember attending a Family Hui (baby group) meeting when my son was about 7-weeks-old. I sat on the breezy beach talking with the group leader while we waited for the other moms and babies to arrive. My son peed, and I changed his diaper. About a minute later he peed, and I changed his diaper. Then another minute later he peed, and I changed his diaper. I had already gone through three cloth prefolds, and the meeting hadn't even started yet! I soon gained the confidence to potty my baby during the weekly Family Hui meetings. The reason I like to carry a travel pack of wipes (10 count) is that I don't go through disposable wipes very fast while practicing EC. The more natural brands of baby wipes that I have tried tend to dry out or mold if left in the diaper bag too long. Next time around I might stick with just cloth wipes. Bringing a swim diaper serves two purposes: it's there for impromptu visits to the beach, and it can also serve as an extra diaper. It took me months to realize I could leave the Earth Mama Organic Diaper Balm at home. It's not like I was ever applying it while out and about. I personally didn't need to bring breast pads, but you may want to. At this stage, I didn't even bother bringing along a toy, but I'm pretty minimalist when it comes to toys. Update 9/14/18: Here are some items I switched to carrying in my diaper bag when my daughter was 2-3 months old. Update 12/11/18: Here's what I switched to carrying in my zero-waste natural diaper bag once my daughter was six-months-old. Update 3/21/19: Here's what I'm packing for my second child now that she's a toddler. I always like to be prepared, but as my son got older, I realized that I could bring fewer and fewer items with us. There was one incident, shortly after my son switched to underwear, where he had an accident at the playground, and for some reason I didn't have an extra outfit packed for him. I took off his wet shorts and undies; put him into the carrier (thank goodness for the carrier! ); and walked across the street to T.J. Maxx. I bought him a new pair of shorts; rinsed him off in the bathroom; and he was ready to go back to playing. 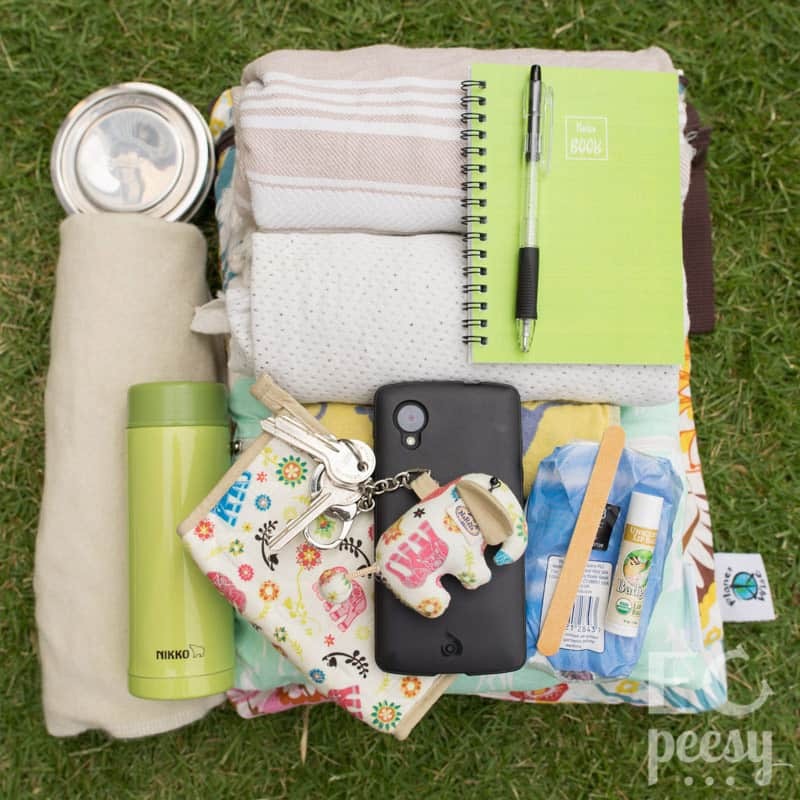 So even if you are out and about without an essential diaper bag item, chances are there is a store nearby where you can buy it! I hope you now feel prepared to pack a diaper bag for elimination communication away from home. 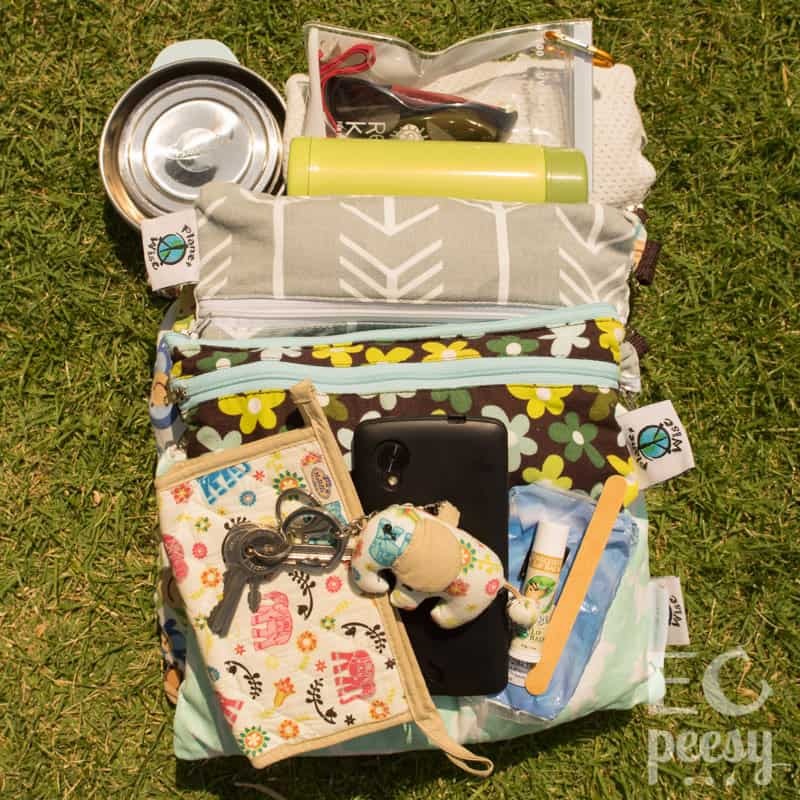 If you are still expecting a baby with whom you plan to practice EC, you may want to Create an Amazon Baby Registry and include a diaper bag, wet/dry bags, and a travel potty. You may also want to read our lists of the Best Cloth Diapers for EC and recommended Elimination Communication Supplies. Would you like to receive tips on practicing EC and early potty training? Which diaper bag have you found to be the most convenient for elimination communication? What do you bring for EC away from home? Heidi is passionate about spreading awareness of elimination communication and early potty learning. She has always been an environmentalist and strives to live a minimalist and zero-waste lifestyle. Heidi practiced EC with her son, starting at one-month-old, until he reached potty independence. She is now practicing EC from birth with her baby girl. Thanks for sharing the backpack diaper bag that’s working for you. It’s hard to find a backpack that’s the perfect combination of function and fashion. That sounds convenient. I tried to check them out, but it looks like the convertible day bags are sold out at the moment. We make potty learning #ecpeesy! Follow us on social media @ecpeesy. to receive tips on elimination communication and potty training? Elimination Communication Benefits – Why EC is Awesome! © 2018 EC Peesy. All Rights Reserved. Want to learn more about elimination communication and early potty training?